Many wonder how Meniere’s disease got its name. In 1861, a French doctor by the name of Prosper Meniere was the first to realize the symptoms associated with this condition came from the ear, not the brain (as was commonly believed at the time). However, the cause of this condition remains unknown. What Causes Meniere’s and What Are the Symptoms? The exact cause of Meniere’s remains a mystery to those in the medical community. Some theories indicate a food allergy may be to blame. Others say an inner ear injury might be responsible. It has been noted you are at a higher risk for it if someone in your family also has it. Episodes of Meniere’s disease are unpredictable and may last from 1 to 3 hours depending on how severe of a case you have. The attacks often reoccur and increase in frequency and severity. This causes the disease to become more and more disabling as it increases. 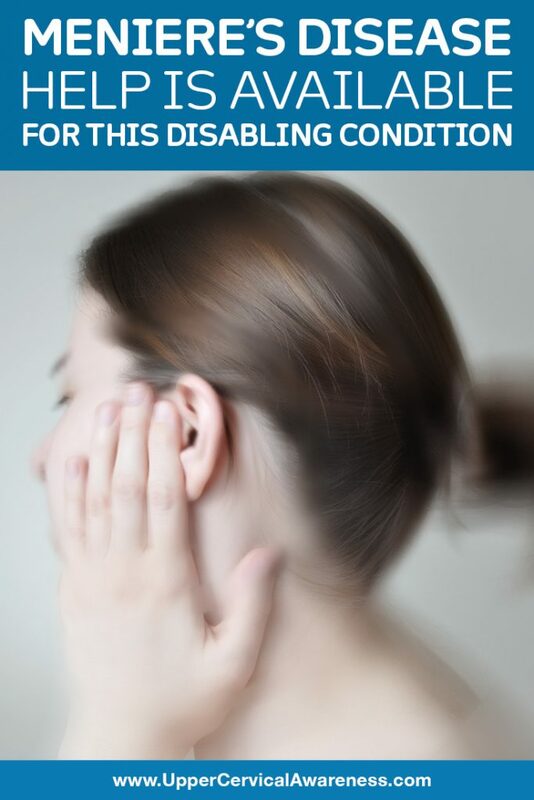 Early on in the condition, the symptoms will go away in several hours, but hearing loss may take longer to return to its normal range. Unfortunately, hearing loss can become permanent due to middle ear changes and may make you very sensitive to loud noise. A study of 139 Meniere’s patients is providing sufferers of this condition with hope for relief. Each of these 139 patients had some type of trauma to their head or neck before the onset of the symptoms of Meniere’s disease. Vertigo was distinguished as one of the most intense symptoms. Upon examination, it was noted they all had a misalignment in one of the top bones of the spine, either the C1 or the C2 vertebra. They were subsequently given an adjustment tailored to their needs by an upper cervical chiropractor. Out of these 139, only 3 did not see positive results. When follow up was done two years later, It was noted that their symptoms improved from a severity of 8.5 to a mere 1.4 out of 10. They reported being able to perform their day-to-day routine activities. They were able to work, have better relationships with other people, and drive a car. There was some lingering dizziness, but it never got to the point of vertigo. Occasional nausea was reported without the presence of vomiting. If they had Meniere’s episodes — which was rare — they were not as severe and did not last as long as they did previously. This holds out hope for those with this debilitating condition. In another case study, a man named Jack had been dealing with Meniere’s symptoms and went to see an ear, nose, and throat doctor. The doctor suggested that Jack have surgery to eliminate his Meniere’s disease. Jack did not feel that surgery was an option he wanted to explore. He was happy he did not agree to the surgery as his symptoms reduced after just six weeks of upper cervical chiropractic care. He was delighted to report after a year that his vertigo was completely gone. Upper cervical chiropractors focus on finding the tiny misalignments in the upper neck, particularly with the C1 and C2 vertebrae. These bones were designed to protect the delicate brainstem from damage. However, if they have been misaligned due to a trauma to the head or neck — even if it was a long time ago — they may actually put the brainstem under stress and cause it to send improper signals to the brain about what is happening in the body. The balance system of the inner ear can also be negatively impacted. We use a method that is gentle and does not require us to pop or crack the neck or spine to get positive results. Rather, we encourage the bones to move back into place on their own so as not to further stress the neck area. Once this is corrected, proper neural signals can be restored and damage can begin to heal. This is often all that is needed to see an improvement in or an end to Meniere’s disease.